Marcella Hazan’s Classic Italian Cookbooks have sat on my bookshelf for at least two decades, but I have to confess that there is little I have cooked from them. I shifted them to the beach house kitchen many years ago and there they languish, unloved, not even where I can readily reference them to find a recipe for the September Cookbook Guru. They are great references for introducing novice cooks to Italian cuisine or for those more experienced cooks wanting to add a touch of authenticity to their Italian repertoire.The first book, published in 1972 covers all the basics of good Italian food, simple, uncomplicated meals made from seasonal produce and basic Italian pantry items. I found this Chicken Cacciatore recipe from The Classic Italian Cookbook online. I modified the original recipe slightly to comply with my diet, but the end result was delicious. We enjoyed it with a rocket salad and the leftovers of the bottle of wine. The Cookbook Guru is open to everyone who likes to cook and blog. We explore a range of publications, both old and new and the featured book changes each month. Join the band of bloggers world wide who take part, it’s a great way to learn explore different cookbooks. Season the rice flour with salt and pepper then toss the chicken in the flour, shaking off any excess. Discard any leftover flour. Heat the oil in a large heavy based pan with a tight fitting lid. Saute the chicken pieces until well coloured. Set aside. Add the rosemary, bay leaf, carrot, red pepper and celery to the pan then over a medium heat for 6–8 minutes. Deglaze the pan with the wine, scraping all the brown bits from bottom of pan. Reduce by half. Add the tomatoes, then the chicken. Return the pan to the boil, cover then reduce the heat to a simmer. Cook until the chicken is done, about 30 minutes. Stir in parsley. Taste the sauce and season if necessary. Oh I understand the cookbook overload. I had a clean out a few years ago and reduced numbers, but still I have many that are under utilized. Do you use the app Eat Your Books? It does help you keep track of the recipes in the books..
Its 7 a.m. and I’m now craving chicken! Thanks! I reckon it would be tastier than breakfast cereal…. Go on, make him swoon…. I have one M H cookbook, and I don’t think I’ve ever cooked from it. I think, in spite of loving and treasuring traditional cookbooks, I’ve gotten used to the fancy contemporary ones with all of the slick photographs. Sad. I’m going to dig it out and look at it today! I have some old unillustrated cookbooks I still use over and over, but I think most of Hazan’s recipes are for food that I know well and cook without reference to a recipe. The Italian influence on our food here is enormous. I like the recipe, and also your new picture on the gravatar or whatever it’s called! Thanks Aneela, it was time to come out…. I think this is one of the first things I ever made from her books, so it feels nostalgic to see it here. Books and food both have the ability to bring back memories, enjoy the reverie. I think I’m in the same boat as you. Marcella Hazan (not personally, but her book) has sat on my shelf for a long time, at least decades, and I look at it every now and then, but I don’t recall ever cooking from it. Will certainly have to rectify that soon and join in the Cookbook Guru. As always, your photography captures your delicious looking food. I think the rosemary perched on top makes the dish! 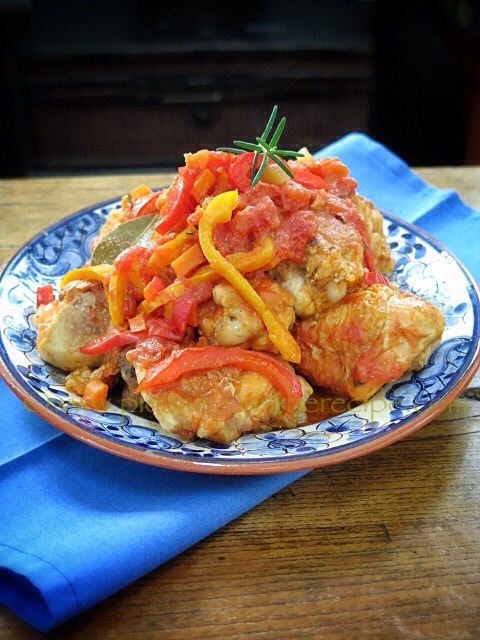 Our first contribution this month comes from Please Pass The Recipe in the form of Chicken Cacciatore. It’s an old classic that is worthy of reliving. Her books taught me how to shop and how to cook when I first started…I am very fond of them all! Her tip which I use the most is that pasta water should be as salty as the sea…her Ossobucco and Risotto Milanese is THE best! It’s interesting isn’t it Selma, A friend, a co worker and Claudia Roden’s Food of Italy were my basic Italian cookery teachers. I’m sure it was just a case of which book came into my kitchen first. I too have books that I’ve never cooked from – some were gifts, some were wishful thinking at a $2 sale. It’s now at the stage where the entire family has been tasked with finding something we all might like eating from each of them, or they go to the fundraiser garage sale. I guess that’s the phase I’m in right now! This entry was posted on September 4, 2014 by ladyredspecs in Chicken dishes, FODMAP diet, Food, Gluten Free, Main Meals, The Cookbook Guru and tagged chicken, Italian, Marcella Hazan, peppers, the cookbook guru, tomatoes.